Many Simpsons Characters Are Named After? When naming characters in his iconic and long running cartoon The Simpsons, creator Matt Groening took more than a little bit of inspiration from the streets and locations scattered around his home town of Portland, Oregon. Some of the local place names are instantly recognizable to even a casual viewer. 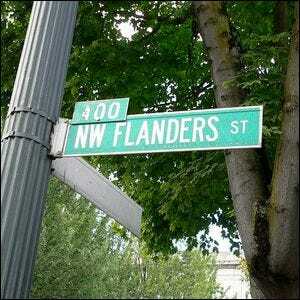 There’s a Flanders Street, namesake of the overly cheerful Simpsons’ “hi-diddly-do-there” neighbor, Ned Flanders—the sign for Northeast Flanders has been vandalized a number of times over the years with locals turning the NE Flanders into NED Flanders. Homer’s boss and miserly old owner of the Springfield Nuclear Power Plant, Montgomery Burns, gets a double nod—there’s a Montgomery Park and a Burnside street. Kearney, one of the bullies in the trio that torments Bart in and out of school, is named after Northwest Kearney Street. Bart’s best friend Milhouse Van Houten is named after North Van Houten Avenue. The Reverend Timothy Lovejoy is named after Northwest Lovejoy Street. Mayor Quimby is named after Northwest Quimby Street. Even Sideshow Bob gets in on the act, his full name is Bob Terwilliger and there’s a Southwest Terwilliger Boulevard in Portland. Even the streets themselves make an appearance. The Simpsons’ fictional address of 742 Evergreen Terrace is more than a bit suspiciously similar to Matt Groening’s childhood address of 742 S.W. Evergreen Terrace.